Like property research, family research is another popular research topic here at the Peel archives at PAMA. People visit and contact us from all over North America and beyond looking for their Peel roots. Genealogy – the study of your past family relationships and origins – is an absorbing and meaningful way to find out how you came to be who (and where) you are. It’s also becoming an increasingly popular pastime. As life becomes more and more fast-paced, perhaps we want to connect with deeper ties that bind us across time. This post won’t be a primer on genealogical research – there are already many good books and webpages on how to get started. (See the bottom of this page for some reliable web-based resources.) Instead, we’ll be giving you an overview of how our unique archival records might fit into your hunt for your ancestors. It’s very important to realize that no single archives, library, or online collection is going to answer all your questions. First, we’ll give you some things to keep in mind as you prepare for a visit to our archives. Then we’ll discuss what genealogical sources you can find here. Do a little homework first. Finding answers depends on asking the right questions. 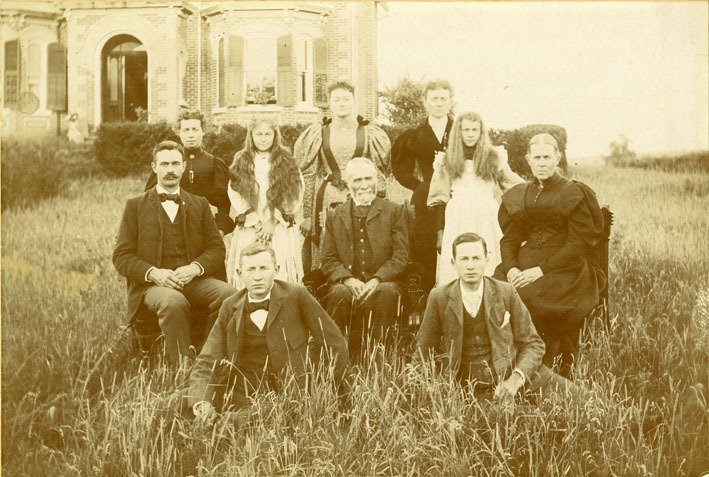 As genealogical experts suggest, first gather together everything you know about your Peel ancestors from family resources; then you can zero in on specific directions to explore. After all, you don’t want to be reinventing the wheel if a family member has already done research. Prepare yourself for some detective work. People sometimes contact us simply asking if we have any information we can send them on their ancestor. The answer to this question is not a simple one and can involve a lot of research to answer. Unless someone has already done work on your ancestors, there’s not likely going to be a file on them. Many archival records are not organized by people’s names but by the function or origin of the records. For example, land records are kept together and are organized by a lot’s legal description. This means that your ancestor’s name alone may not be enough information to go on. Family research can be a slow process of sifting through detailed and unusually organized records and it is best done by you or someone you can work with closely. Be open minded about where your ancestor may have appeared in the records, bring tools to document your research, and above all come armed with patience and time. Set up some realistic expectations. Dead ends and gaps in the records are a fact of genealogical research: after all, our forebears didn’t know we’d use their records to try to trace them! Find out what our archives does and doesn’t have. There’s no such thing as a one-stop shop for family research. Archives house original one-of-a-kind records, which means every archives has things no other archives does. To make the best use of your time it’s just as important to know what we don’t have as what we do. This part is easy, because that’s what we’re going to tell you next. With rare exceptions, the Peel archives doesn’t collect the following major genealogical sources: official birth, death, and marriage (vital statistics) registration documents; census returns; original church records; and immigration and ship’s passenger records. We also don’t collect records that have no clear relationship to Peel’s history or people. Other archives are responsible for these materials because of their relationship to the institutions that created and collected these records. For some guidance on these archives, see the non-Peel resources at the end of this post. Many of these records are also accessible on major online databases. So what can you learn about your ancestors in our archives? It’s best to think backwards here. Where and why would your ancestor have been noted in a historical record? Here are the Peel records where they might appear. William Perkins Bull was a Peel-raised self-made industrialist, philanthropist, and historian who in the 1930s sent teams of researchers throughout Peel to gather facts about the history of the area and its people. His collections are the single greatest source of knowledge about Peel’s history. Bull’s researchers collected information on early families of Peel by searching newspapers and archives and conducting surveys and questionnaires. They grouped their notes under family surnames. You may find your ancestors are represented in these files if their surname is one of those available (check our website to see the list of surnames). Keep in mind that the information in these files is a) second-hand and so inaccuracies may have crept in; b) in the form of rough notes and not polished family histories; and c) not necessarily related to your ancestors of the same name. 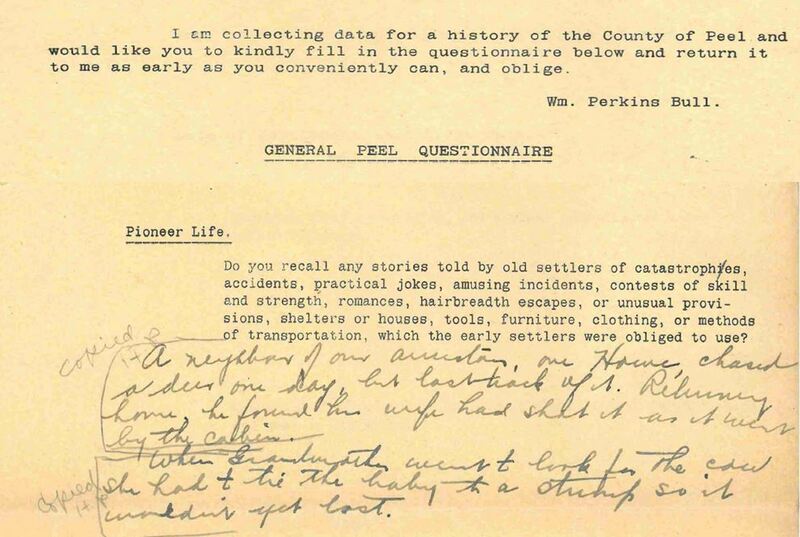 Perkins Bull family files can include newspaper clippings and transcriptions, notes on archival records (such as land records), oral history transcriptions, sketches of family trees, and partially filled in questionnaires. Other Perkins Bull research files, such as his village, town, or industry files may also provide clues to your ancestors depending on their occupations and prominence in their communities. Your ancestor may appear in records of ownership of land and property. Our lists and copies of registered land transactions can reveal facts about your ancestors, like when they bought and sold land, how much they paid, and who their neighbours were. If they inherited land, the text of wills can also reveal genealogical information. Assessment rolls show how much people paid in taxes on their property. Depending on the roll, information can include the age, occupation, and religion of the owner. Note that to find your ancestor’s land records, you’ll already need to know what land he or she occupied. Because land records are organized by lot and not surname, it’s generally not possible to find out from land records where your ancestor lived from his or her name alone. Read our post on property research for more information about these records. 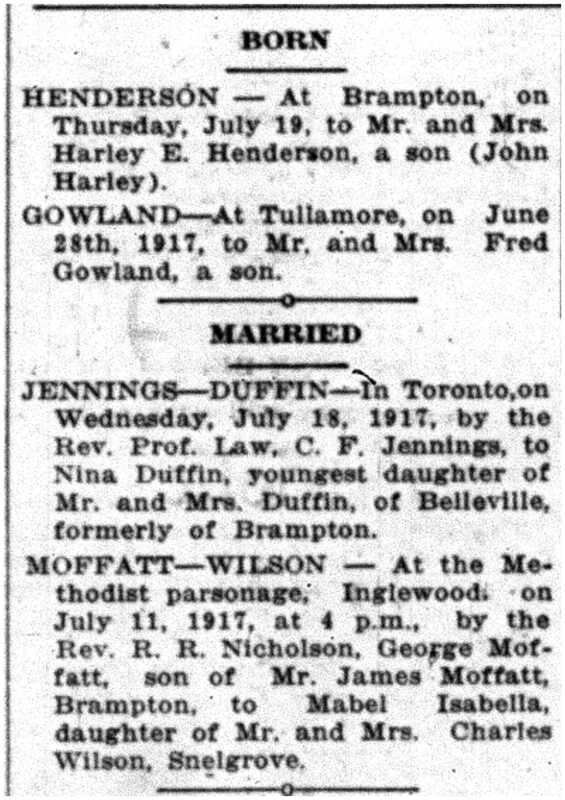 Your ancestor may appear in newspapers thanks to family announcements of births, engagements, marriages, deaths, and other news. The archives has early issues of Peel newspapers, but only selected date ranges are indexed by surname. If the date you’re interested in lies outside these ranges, you’ll need to know a fairly precise date range to search (to find, say, an obituary). Cemetery transcriptions: These aren’t archival records but rather compilations made by volunteers of text from grave markers in Peel cemeteries. Directories: The precursors of the phone book, these listings are available for Peel for very limited years. Wills and estate records: The archives can provide access to some Peel wills but our collection is not complete. Military service cards: The archives holds official Peel War Records Board service cards for the Second World War and unofficial service cards for the First World War compiled by William Perkins Bull. Maps: 1877 and 1859 maps of Peel show who owned township lots in Peel in those years. Education Records: The archives holds historical student registers for many Peel schools. Please note that there are strict controls on access to these registers for 90 years after the date of the record due to privacy legislation. Tweedsmuir Histories: Peel’s Women’s Institutes compiled these scrapbooks of local history. Researchers occasionally find references to their relatives in them. Photographs: The archives houses thousands of historical images. Keep in mind that pictures of your ancestors will only be discoverable if they’ve been identified in a searchable way. Many pictures are not. Family Histories: Researchers like you donate the results of their research to the archives in the form of published family histories. It’s worth checking whether someone has already researched a branch of your family. As always, for more information on the coverage of these records, feel free to contact us. Family research can be an exciting and, at times, exasperating challenge. Still, in the archives many researchers find intriguing facts and hints they never expected, not only about their ancestors but about the world they lived in. For new Ontario family researchers, web pages from the Archives of Ontario and the Ontario Genealogical Society provide good tips. We specialize in documenting Peel’s history. If you’re looking for original records – especially official records – that are tied to a place outside Peel, you’ll need to contact archives in that area. 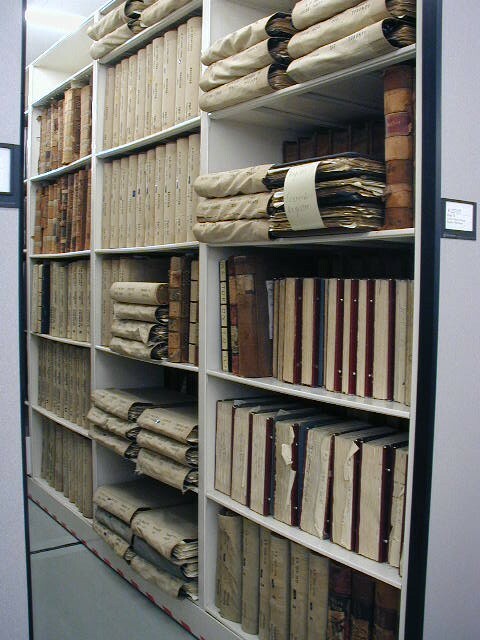 A partial listing of Ontario archives is available through the Ontario Heritage Directory. A list of Canadian archives is also being compiled. The Archives of Ontario is the official repository for registered records of these major life events, even if they took place in Peel. Often, however, you can often access the information from the originals via an online genealogical database (see below). For more recent vital statistics certificates, you’ll need to contact ServiceOntario. Before Canada started registering BMD’s, religious institutions tended to function as the record making and keeping entities for major life events. Church and parish registers are generally held by the archives of the denomination who created them (or its successor). The Archives of Ontario offers a comprehensive guide to religious archives in Ontario and holds originals and copies from some churches. Some church records are available on major genealogical databases. Our reference room has a limited number of transcriptions (not originals) of Peel church records. As the federal archives, Library and Archives Canada (LAC) keeps original census records. You can search them via LAC’s website or via an online genealogical database. Online family research databases can be a useful way to quickly gather information about your ancestors. The two most popular are FamilySearch.org (a free service) and Ancestry.ca (a subscription based service that is often available for free at public libraries). These databases scan, aggregate and make searchable common genealogical records like vital statics documents, census records, voter’s lists, military records, and passenger lists. Keep in mind the information you’ll find is based on what the database has collected so far and how you construct your search. Family researchers can also share their research with other members through the database. Genealogy forums and societies: The Ontario Genealogical Society, and particular the Peel-Halton branch offer ways to confer with other family researchers. Family History Centres: Search facilities and advice are available at Family History Centres throughout Ontario. They are maintained by the Church of Jesus Christ of Latter Day Saints who for religious reasons believe it’s important to identify your ancestors. Professional genealogists: If you need intensive help with your search – someone to coordinate searches across archives, do exploratory research in an archive on your behalf, or advise you on further avenues – a professional genealogist may be your best bet. Try the Ontario chapter of the Association of Professional Genealogists to find an expert in your area.